Rated PG for some mild language and innuendo. While Skrat the Saber Toothed Squirrel is still ineffectually trying to regain his precious acorn, the misfit trio of Manny the Mammoth, Sid the Sloth and Diego the Sabretooth Tiger have settled down in an isolated valley with numerous other animals. However, the trio discover that the ice wall surrounding the valley is barely holding back a massive body of water behind it and it's melting state threatens to break and flood the valley. With their one chance of survival being a boat at the other end of the valley, the trio follow the desperate exodus there. Along the way, they meet Ellie, a female mammoth who is convinced she's a opossum like her brothers. While the strange group continues the trek, they must learn to get along even as Manny struggles to find some connection to this strange female who may be the only other one of his kind. Still cool but less solid the second time around, 29 March 2006 Author: blue cheese from Philippines Manny the woolly mammoth (voiced by Ray Romano), Sid the sloth (John Leguizamo), and Diego (Dennis Leary) the saber-toothed tiger embark on yet another journey in "Ice Age: Meltdown, "the sequel from the 2002 blockbuster by Blue Sky Studios and released by 20th Century Fox. This time, ice is melting and a great flood is threatening to drown all animals in the valley in three days, much to the delight of vultures who are keen on having a buffet with the bodies of those who will be unfortunate enough not to outlive it. The only way to survive is to get to an "ark" at the other end of the valley. Along the way, they meet Ellie (Queen Latifah), perhaps the only other mammoth left aside from Manny, but unfortunately, thinks of herself as a possum, with her "brothers" Crash and Eddie (Sean William Scott and Josh Peck... who's who, I don't know because I never got to track their names). 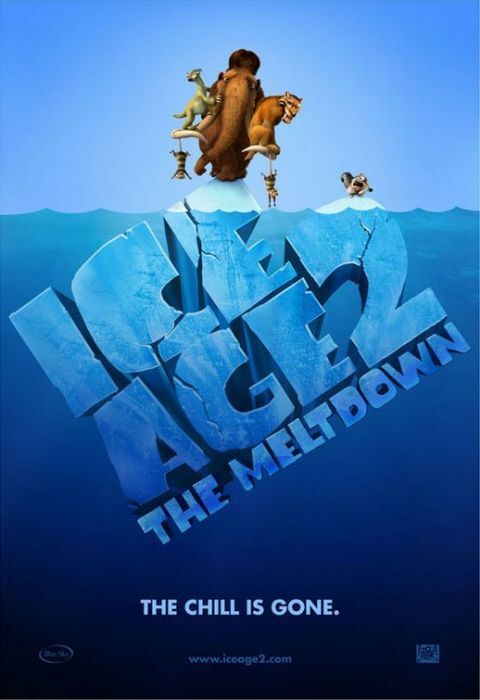 "Ice Age: Meltdown" is, first and foremost, the inevitable sequel. And while it is still an enjoyable movie, it's very clearly more, or less (depending on how you would look at it), of the same. 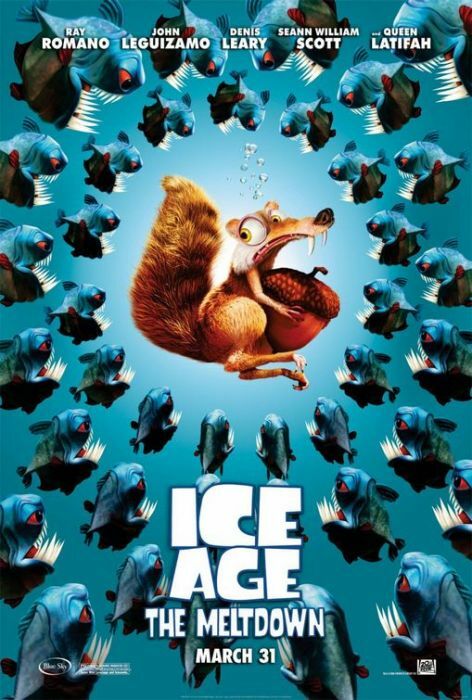 It still follows up from the first one, but all in all it feels that there wasn't enough material to hold a full-length movie that the character of Scrat has been given more screen time even if what he does trying to get his acorn doesn't advance the plot at all, albeit helping the film reach barely an hour and a half. 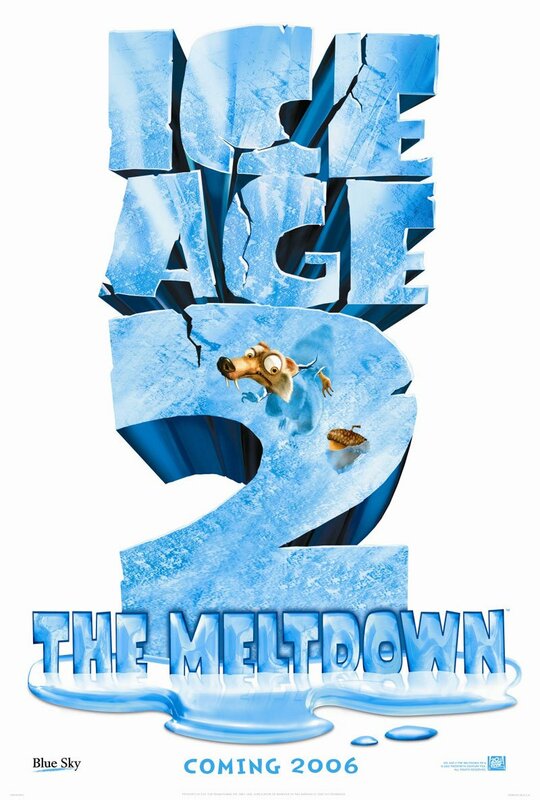 While this movie still does manage to amuse from time to time, on the whole the plot feels more obligatory and jokes seem to be a little bit more blunt.That's not to say "Ice Age: Meltdown" is a total waste because it does still have a few aces up its sleeve. Latifah brings a brilliant performance on her character Ellie, as are Scott and Peck on Ellie's two "brothers." And while much of the first two parts of the film lags, it builds up during the climax and from there never lets go. The animation looks quite excellent as well.It still has enough wit and laughs to support it most of the time but it's really much more of a standard film than the first one, and the animation genre in general doesn't reach new levels with this. Still, it's one of the better sequels there is, and it's a cool way to start the summer (in this side of the world, that is).